Match ends, West Ham United 1, Liverpool 2. Second Half ends, West Ham United 1, Liverpool 2. Corner, Liverpool. Conceded by Adrián. Attempt saved. Raheem Sterling (Liverpool) right footed shot from outside the box is saved in the top left corner. Assisted by Jordan Henderson. Foul by Jon Flanagan (Liverpool). Attempt missed. Stewart Downing (West Ham United) right footed shot from outside the box misses to the right. Assisted by Pablo Armero. Attempt saved. Luis Suarez (Liverpool) right footed shot from outside the box is saved in the bottom right corner. Pablo Armero (West Ham United) is shown the yellow card for a bad foul. Foul by Pablo Armero (West Ham United). Substitution, Liverpool. Kolo Touré replaces Daniel Sturridge. Substitution, West Ham United. Carlton Cole replaces Mohamed Diamé. Luis Suarez (Liverpool) hits the bar with a right footed shot from the right side of the box. Assisted by Raheem Sterling. Attempt missed. Guy Demel (West Ham United) header from the right side of the six yard box misses to the right. Assisted by Antonio Nocerino with a cross following a set piece situation. Matthew Jarvis (West Ham United) wins a free kick on the right wing. Attempt saved. Daniel Sturridge (Liverpool) left footed shot from the left side of the box is saved in the bottom left corner. Assisted by Raheem Sterling with a through ball. Antonio Nocerino (West Ham United) is shown the yellow card for a bad foul. Jon Flanagan (Liverpool) wins a free kick on the left wing. Foul by Antonio Nocerino (West Ham United). Substitution, West Ham United. Matthew Jarvis replaces Matthew Taylor. Goal! West Ham United 1, Liverpool 2. Steven Gerrard (Liverpool) converts the penalty with a right footed shot to the top left corner. Adrián (West Ham United) is shown the yellow card. Penalty Liverpool. Jon Flanagan draws a foul in the penalty area. Penalty conceded by Adrián (West Ham United) after a foul in the penalty area. Substitution, West Ham United. Antonio Nocerino replaces Kevin Nolan. Attempt missed. Daniel Sturridge (Liverpool) left footed shot from outside the box is too high. Assisted by Luis Suarez with a headed pass. Attempt missed. Pablo Armero (West Ham United) left footed shot from outside the box is high and wide to the right. Andy Carroll (West Ham United) hits the bar with a header from the centre of the box. Assisted by Mohamed Diamé with a cross. Attempt saved. Daniel Sturridge (Liverpool) left footed shot from outside the box is saved in the bottom right corner. Assisted by Steven Gerrard. Attempt blocked. Lucas Leiva (Liverpool) right footed shot from outside the box is blocked. Assisted by Glen Johnson. Attempt saved. Luis Suarez (Liverpool) left footed shot from the left side of the box is saved in the centre of the goal. Assisted by Raheem Sterling. 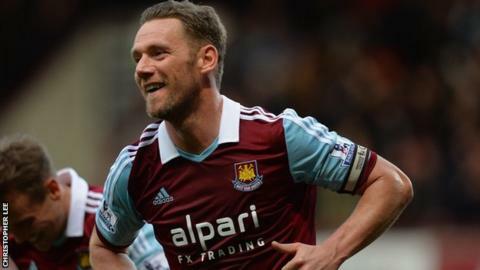 West Ham captain Kevin Nolan will be fit to face Liverpool after recovering from the back injury he suffered in Monday's win over Sunderland. However, Hammers defender George McCartney is expected to miss the match with a hamstring problem he picked up in the same game. Liverpool manager Brendan Rodgers has no new fitness concerns for this match. Jose Enrique, who has been absent since November with a knee injury, has been ruled out for the rest of the season. Liverpool are attracting global recognition after their wonderful unbeaten 2014 league run has seen them rise from outsiders for a top-four place to title favourites in many eyes. Brazil's World Cup-winning captain Cafu has taken a shine to England prospect Jon Flanagan with the legendary full-back taking to Twitter after the table toppers' romp over Spurs: "Good to see the Red Cafu is playing well". Brendan Rodgers says the team are enjoying their position at the summit but the immediate task is this banana-skin game. Imagine if they beat Manchester City and Chelsea in the coming weeks but lose out on the title because they lost at West Ham. They wouldn't be able to forgive themselves. "Pessimistic Liverpool fans might look at this game and think that ex-Reds Stewart Downing and Andy Carroll will be lying in wait, and so will West Ham boss Sam Allardyce. "For this game, I can see Allardyce denying Liverpool space to play and looking to hit Carroll early with the ball, then trying to get bits and pieces around him from his knockdowns." Andy Carroll will be determined to prove Rodgers made a mistake by selling him. If Cardiff could expose frailties in the league leaders' defence, the West Ham battering ram will be licking his lips and Kevin Nolan will profit from Carroll's knock downs. What must be going through the home captain's mind? A Liverpool fan, raised in Toxteth, Nolan played for the club as a very young schoolboy and admits the Reds have a special place in his heart. If he nets the winner West Ham will virtually be safe but he could have killed Liverpool's dream. On form, a home winner is unlikely. Suarez is hunting his 30th goal. Sturridge has 23. Gerrard has nine in his last 14 games. Many neutrals would love to see him lift the trophy and Rodgers rewarded with the title ahead of schedule. I have met many different kinds of manager in my 41 years involved in football. He is one of the most genuine, thoughtful and quietly inspirational men I have encountered. Given that West Ham have won only two of 16 matches against top-half teams all season, I can't see Liverpool losing this, but I have a sneaky feeling that the Upton Park boo-boys may change their tune and inspire their team to a point. West Ham have only won two of their previous 21 meetings with Liverpool in the Premier League (W2, D4, L15). There have been 27 goals in the last eight clashes between these sides at Upton Park. Liverpool have only failed to score once in their last 10 league visits to Upton Park. That was in a 1-0 defeat by the Hammers in January 2008. West Ham have won six of their last nine Premier League matches, and four of their previous five games at Upton Park. Sam Allardyce's side have lost five matches from winning positions this season - the most in the top flight. They have only won two of the 16 games they have played against teams in the top half of the table this campaign (W2, D3, L11). The Hammers have only recovered to take one point from the nine league matches in which they been behind at half-time. Their last eight league goals have been scored by seven different players, including an own goal from Hull's James Chester. Only Andy Carroll has scored more than once. Liverpool are the only team yet to lose a Premier League game in 2014, winning 11 of their 13 matches and drawing two. This is their longest unbeaten run in the league run since November 2008 - February 2009 (15 matches). They are looking for their ninth consecutive league victory this weekend. The last time they won nine matches in a row was in May 2006. Luis Suarez and Daniel Sturridge have a combined total of 49 goals this season - the only Premier League strike partnership to score more in a single season was Newcastle's partnership of Peter Beardsley and Andy Cole in 1993-94 (55). Suarez has scored 29 goals this season and is now just two behind the Premier League record for a 38-game season held by Alan Shearer (1995-96) and Cristiano Ronaldo (2007-08). Glen Johnson has scored in three of his last five league games against former club West Ham, including the last two trips to Upton Park. Jordan Henderson could make his 100th league appearance for Liverpool. He has been involved in a career-high 11 league goals this season (goals and assists).